If you haven't noticed by now, the source and drain connections on a JFET look identical on the schematic symbol. Unlike the bipolar junction transistor where the emitter is clearly distinguished from the collector by the arrowhead, a JFET's source and drain lines both run perpendicular into the bar representing the semiconductor channel. This is no accident, as the source and drain lines of a JFET are often interchangeable in practice! In other words, JFETs are usually able to handle channel current in either direction, from source to drain or from drain to source. Note that there is no current going through the gate. As a reverse-biased PN junction, it firmly opposes the flow of any electrons through it. As a voltage-controlled device, the JFET requires negligible input current. This is an advantageous trait of the JFET over the bipolar transistor: there is virtually zero power required of the controlling signal. This resistor's value is not very important. The capacitance of the JFET's gate-source junction is very small, and so even a rather high-value bleed resistor creates a fast RC time constant, allowing the transistor to resume conduction with little delay once the switch is opened. Like the bipolar transistor, it matters little where or what the controlling voltage comes from. We could use a solar cell, thermocouple, or any other sort of voltage-generating device to supply the voltage controlling the JFET's conduction. All that is required of a voltage source for JFET switch operation is sufficient voltage to achieve pinch-off of the JFET channel. This level is usually in the realm of a few volts DC, and is termed the pinch-off or cutoff voltage. The exact pinch-off voltage for any given JFET is a function of its unique design, and is not a universal figure like 0.7 volts is for a silicon BJT's base-emitter junction voltage. Field-effect transistors control the current between source and drain connections by a voltage applied between the gate and source. In a junction field-effect transistor (JFET), there is a PN junction between the gate and source which is normally reverse-biased for control of source-drain current. JFETs are normally-on (normally-saturated) devices. The application of a reverse-biasing voltage between gate and source causes the depletion region of that junction to expand, thereby "pinching off" the channel between source and drain through which the controlled current travels. 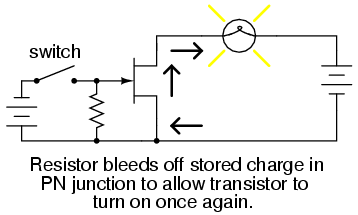 It may be necessary to attach a "bleed-off" resistor between gate and source to discharge the stored charge built up across the junction's natural capacitance when the controlling voltage is removed. Otherwise, a charge may remain to keep the JFET in cutoff mode even after the voltage source has been disconnected.